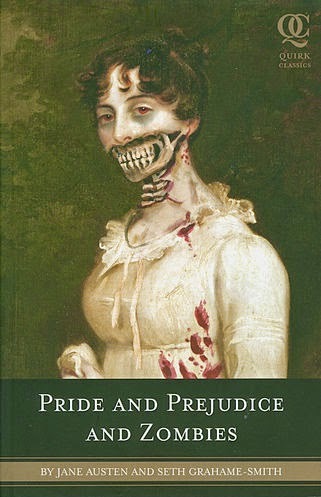 I got Pride and Prejudice and Zombies at around the same time as Sense and Sensibility and Sea Monsters, for largely the same reasons. In comparison to the book that I reviewed earlier though, this has taken off in a big way, to the point where there's actually a film adaptation coming out soon. I guess I decided to read this now because I wanted to see if there was any reason for the difference in general reception. Pride and Prejudice and Zombies follows the Bennet sisters, a group of young ladies who are as proficient in the deadly arts of zombie slaying as they are in more traditionally feminine pursuits. The second sister, Elizabeth, is a particularly skilled warrior and as such derives great pride from her duty to slay hordes of unmentionables. She derives an equal amount of annoyance from her mother's constant attempts to marry off her and her sisters. In their mother's latest attempt, they are obliged to meet with their new neighbour, Mr Bingley. Whilst there, Elizabeth is insulted by one of their new acquaintances by name of Mr Darcy. While her warrior's sense of pride demands that she rend his head from his shoulders and crush his still-beating heart in his chest, she refrains out of respect for her older sister's new affection for their new neighbour. In the course of her association with Mr Darcy, Elizabeth may find that first impressions can be deceiving. I wasn't as fond of this one as I was of Sense and Sensibility and Sea Monsters. In my previous review, I stated that if you like the concept then you will probably like the book. While I still think that that point is relevant to Pride and Prejudice and Zombies, there are a couple of things that I thought were done significantly better in the sea monster version. Firstly, the zombie addition was kinda poorly implemented. While saying that it could be taken out entirely is something of a redundant statement, I think that the zombies could have been used in a more interesting way. In Sense and Sensibility and Sea Monsters, the monster attacks were used to underscore moments of emotional conflict and contrasted nicely with the characters' more frivolous concerns. In Pride and Prejudice and Zombies, the zombies just sort of turn up whenever and don't really pose much of a challenge. I guess I'm so used to seeing zombies used as a metaphor for some fear of humanity's that I was expecting something a little smarter. It screams of a first attempt really badly. Secondly, some of the humour is a bit off-colour for my tastes, mainly the parts involving vomiting. It might fit with the zombie thing, but it wasn't funny at all, just kind of crude and distracting.